Stretched/pillarboxed 4:3 (set with Keep Aspect Ratio). On some systems, there is an issue where only part of the screen is visible. 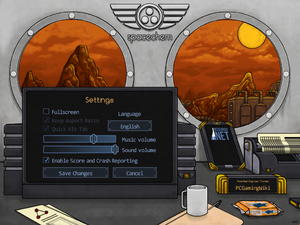 Right-click SpaceChem.exe, select Properties, and go to the Compatibility tab. Check Disable display scaling on high DPI settings, and click Apply.